Commercial & Residential: Fill Dirt, Rip Rap, Shell Rock, Paver Sand, Trucking and MORE! Rip Rap is a loose stone, rock or boulder used to form a foundation to help prevent erosion, line shorelines, protect bridge abutments and pilings. 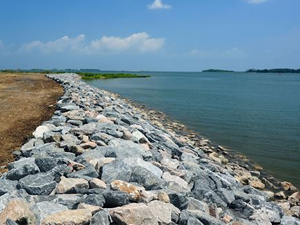 The rip rap helps by creating a barrier to protect structures and shorelines from erosion or damage caused by water. It is also referred to as armor stone, bedding stone, bank and shore or typically rip rap. It comes in varying sizes and also weights. 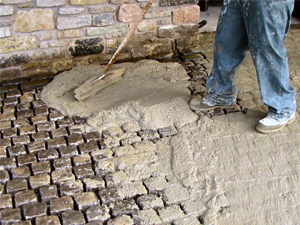 Paver sand is a material often placed between the seams and joints when pavers or stone are being installed for pool areas, driveways, walkways and many other places. The purpose and function of paver sand also referred to as 250 sand is to improve the ability for the pavers to interlock and that aids in the stability as well as durability of the finished surface. Shell Rock consists of naturally occurring deposits formed of broken mollusk shell & corals. This is a common material used in Florida and the most asked for product. 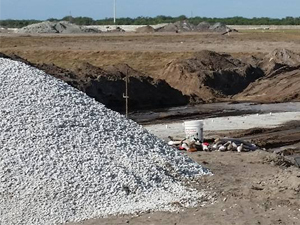 The diverse landscape of the quarries and mines in Florida enables Sitework to offer a full array of Shell Rock materials. Often customers ask for Shell Rock yet find that a host of materials fall under the heading of shell rock. The common definition of a dump truck is a truck with a body that tilts & opens at the back for unloading materials. They are an integral part of the construction and sitework process. 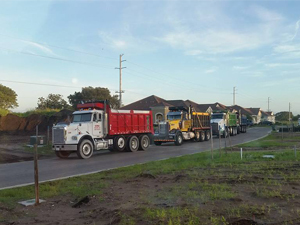 Moving materials such as fill dirt, rip rap, paver sand, road base, shell rock, FDOT rocks/ materials and #4, #5, #57, #89 stone in large quantities dump trucks are needed to move the materials efficiently & safely. Sitework is defined as any part of a construction project that is not part of a building or homes physical structure. 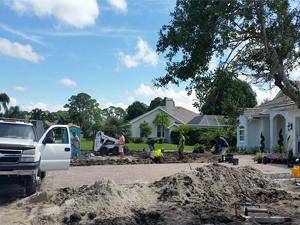 Typically, sitework involves grading, excavation, construction and installation of driveways, roadways, elevation of land and rock placement to assist in erosion control. Often the sitework being provided includes the initial grading and clearing of the land. At Sitework Supplier we are more than just a material supplier. 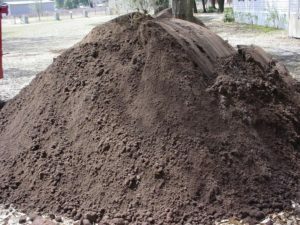 We are pleased to offer our “Complimentary” proposal service providing you with pricing for new parking lots, site work, utility work, on site hauling or hauling materials off site. Please contact us either by phone (941) 286-7000 or email admin@siteworksupplier.com for pricing on any projects you may have.